Coming to World Pride next weekend: A musical revue featuring drag king Mounties, a host of divas, and "the von Trapp kids as you've never seen them before". If that sounds like a blast of an evening, you're welcome to join right in. Singing Out, Toronto's LGBT community choir, is hosting a Big Pride Sing-Along next June 28, featuring a lineup of Top 40 hits and showtunes with the lyrics broadcast for all to see on karaoke-style screens. The boisterous come-one, come-all sing-along is the first the 22-year-old choir has ever held at Pride. "We're known in the queer community, but not super-well-known," says vice-president (and soprano) Genevieve McIntyre. "It's really nice when we can branch out to the rest of the world." The choir, which bills itself as "Toronto's lesbian, gay, bisexual, transgender, and queer community chorus," welcomes would-be singers from all over the city, regardless of musical ability. You don't even need to audition to join - but you wouldn't know that from their tightly-rehearsed soprano/alto/tenor/bass arrangements. At a showcase at the Glenn Gould Studio last month, their set lists genre-hopped from Top 40 pop and show tunes to classical and contemporary vocal pieces. The pacing of their concerts vary even more widely, with tearjerking selections dealing with homophobia and suicide sandwiched next to goofy, boisterous odes to gay marriage and Jan Brady (topped off with a liberal smattering of drag). "That's our brand," laughs president (and baritone) Howie Dayton. "We bring you down, and then bring you back up quick, cause we don't want a big, morose show." The choir's set lists are as varied as its members. "We're trying to be inclusive to the L, the G, the B, the T, the Q," Dayton says (straight members are also welcome). "We really want to make sure that we're reflective." Many of Singing Out's members - which now number about 130 at full strength - come to the choir seeking a new social group and the chance to make some beautiful music. That's true of Dayton, who came out later in life and was looking for a way to get involved with the gay community, as well as the opportunity to brush up on his singing. Meanwhile, MacIntyre was originally led to Singing Out by a Google search for "gay choir Toronto". "It's a really good, diverse group of people with different musical skills, but everyone is so dedicated," she says. "That's what makes us sound good." The choir's demographics skew visibly older, but McIntyre appreciates that as another facet of the diversity: "It's really cool to be able to hear their stories - especially some of the older folks, what it was like for them." The group piles into a church basement near Pape and Danforth on Tuesday nights for practice. "(New members) come down to a rehearsal, and many, many stick it out, because we're not auditioned, and you don't need to know how to read music. We really do make it an easy entry into musical performance." 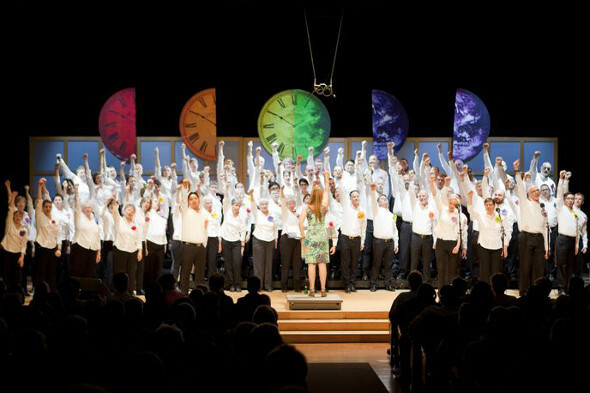 A spring season that saw the choir travel to a Canada-wide choral conference is now being capped off with a banner Pride festival for the group - one that featured them singing in the festival's opening ceremonies in addition to the sing-along showcase. Their hopes are that some of the people singing in the crowd will want to make the transition to the stage. "Anyone can come out. Any time," MacIntyre says. "It doesn't matter. We are here." Middle photo by Michael Rajzman.